Photo editing apps are one of the most popular app category among android apps after social media apps. A reason behind the popularity of photo editing apps for android could be the increase in number of selfie phones launched in market and the trend will likely to continue in 2018 as well thus everyone search for the best photo editing apps. People wants to enhance their photos taken on their smartphone cameras so that they look like one taken on a a DSLR!. People loves to apply those eye catching filters, effects and frames and share the photos with friend s and family. We have compiled a list of 10 popular and top rated best free photo editing apps for you to pick from. These are the best free photo editing apps for selfies you can get in 2017 or even in 2018. Snapseed is developed by a name that you can always trust in terms of quality – Google. This photo editor app still beats all other apps when it comes to image editing on the go. The main thing to talk about is the simplicity of the UI. There are no cluttered stack of buttons, unwanted swipe to show bars or anything. Most importantly no ads. Portrait and smooth filters are perfect for editing your selfie or single pictures, does a great job in blurring the background while keeping the object in the photo in focus. The tools panel gives a ton of options for tuning the image, optimizing the white balance etc. It also provides very minute detailing in terms of editing so that your picture looks best. Also you have got plenty of exporting options to save your edited photo like sharing directly to a WhatsApp group or contact or save a copy in the device. The only minor con we have noticed with this app is that it takes a while to apply a filter. Usually it takes 2-3 seconds in a mid range smartphone but that is no deal breaker. Pixlr image editor is amazing when it comes to user interface. It just beats even the paid versions of image editing apps or even the Snapseed sometimes.This app opens up in a clean screen with three basic options. 1. Opens up the camera for photo and selfies 2. Edit a photo which is taken before 3. Create a collage. Editing a photo is fun using Pixlr. Select an image from file system or gallery, you will see the editing pane in a moment. The tools section has a bunch of option including color correction manual/auto-fix, rotate, crop, blur, smooth, heal etc. You can use the brush and eraser option to draw lines or pixelate the photo. The overlay and frames are just easy to use and gives top quality editing feel. Adding the text option is perfect for creating whatsapp statuses and Facebook profile picture taglines. 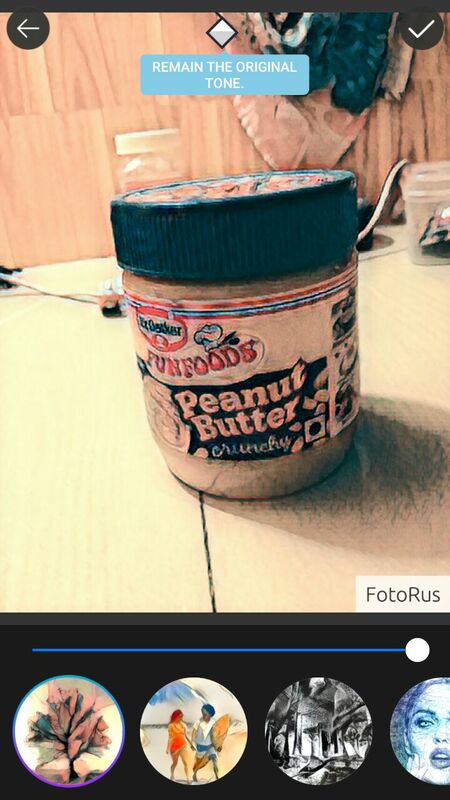 In conclusion, Pixlr is a perfect photo editing app for android compared to many other apps. After reviewing this app, I am still wondering why the other apps with full of ads and poor UI gets more downloads and rating than Pixlr. Unlike Snapseed, PicsArt Photo Studio is a bit more confusing and complicated in look wise, but simpler if you get the hang of it. The opening page shows the hash tags of popular pictures posted by the community or the PicsArt team. You can start editing the picture by taping on the plus icon on the bottom. You have many options like edit a photo, create a collage, draw a picture or take a snap using camera. Creating collage is a fun way to display a bunch of images without losing importance to any one. The editing panel has tonnes of options and filters are quite wide in range to choose from. You can add picture inside picture which is perfect for creating troll images and memes. There is something called “Magic” which is nothing but to add artistic and cartoon effects to your picture which I personally find very interesting. The major con I have found with this app is a very cluttered user interface and annoying ads that sticking here and there and popping up when you do something. But as you know, the developer earns his share through ads so cant be ignored considering the overall quality of the app. I have been using the YouCam perfect for past two years and I love the way it manages to stay on the top photo editing apps list. This app is more like the PicsArt editor but comes with a more user friendly interface. The collage maker seems a bit confusing for the first time users with the text and image blocks combined with ad blocks. Photo editing is straight forward and simple. You select a photo from gallery or take one and apply the filter. You have an option to apply filter whenever you take a picture using YouCam so that you dont need to do an extra step of editing the picture afterwards. The edited images will be saved in the YouCam Perfect folder in the gallery or file system. One disadvantage is in line with PicsArt studio – the ads that aligned with confirmation dialogues and app functions are pretty annoying sometimes. This app is mainly aimed at women who are looking for a beauty camera app even if they advertise it as a photo editing app for all. Cymera image editor app is no different from showing ads competitively from the beginning. The placement of app buttons and ads are very deceptive, sometimes you will click on the ads thinking its is an app operation. 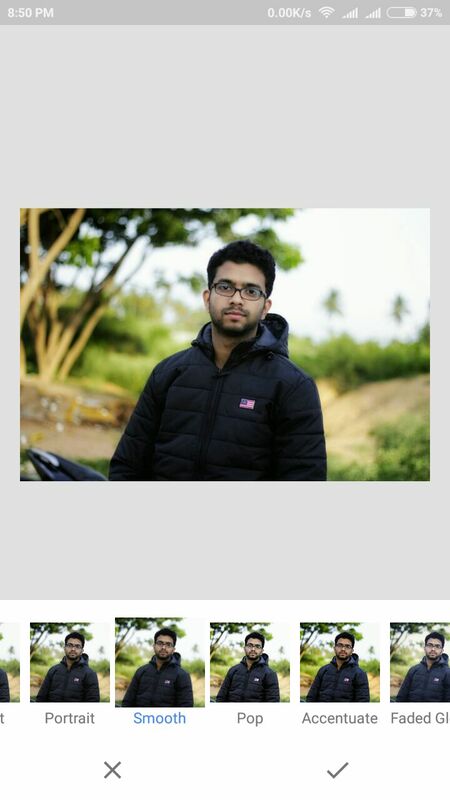 Collage option is not present in Cymera. You will get the basic picture editing and beauty camera options. I have to say the selfie camera performance with this app is pathetic as far as I used it. The picture looked blurred even if you change modes. If you are a guy, do not even try this feature since your lips may look weird and amplified in color with the basic settings. The photo editing pane is feature rich and functionally perfect. It does its job the way we wants. The brightness and color levels can be adjusted easily, filters and scenes are just taps away to be applied. Airbrush is just another copy of YouCam or similar editor with the advantage of not having the ads that popups up here and there. The app has only image edit functionality. Either you can take a picture from camera or the photo you have taken can be edited. The camera can take 3:4 ratio images so that it is perfect for profile pictures like the one you upload for WhatsApp or Facebook without wanting to trim off sides and top. The filters are pretty basic and does its job, all of them has a feminine touch to it. Blur option will try to put the background blurred while keeping the object in focus. The camera performance seems to be struggling from my testing, especially in low light can be termed as a disadvantage of this app. Editing is excellent, moreover no ads are present which is a very big deal compared to other photo editing apps. This is one of the top rated and downloaded photo editing app for android. While the app does not show ads of any kind, it leaves the user an option of purchasing the premium like effects. If you tap on the explore button on the options you can see the photos beautified by this editing app. The gallery button shows you a collection of photos from your device for editing. If you dont like this view, you can tap on the plus sign, to get access to the gallery app of your smartphone or the file explorer to select your photos. Once you have selected the images for editing, a bunch of options will show up on the bottom of the screen like enhance, add frames effects, sharpness, adjust etc. While most of the time Photo Editor by Aviary is more than sufficient, it does not allow picture in picture editing as supported by PicsArt. Adobe has done a decent job in android as well. The photo editor tools is very neat and has included a large number of editing choices and filters. The UI that welcomes you is very neat and straight away gives you four options. The camera option interestingly allows you to open up any of the camera pp that you have installed in your phone instead of the app integrated one, which is a great move unless the app is integrated with a better camera than inbuilt camera. Taping the gallery also pulls up the app selection popup from which you can select your inbuilt gallery of file manger. You will get access to the Adobe creative cloud for which you need too signup using Facebook or google or the adobe ID. You will get access to 60 plus professional looks and advanced corrections like Denoise and Defog for free. Yet another app for girls who wants to do makeup to even the taken pictures. This app is also clogged with plenty of advertisements but seems to no better when compared to apps like PicsArt and YouCam. The app has options to create a collage or edit a photo by adding certain filters and adjusting image properties. The beauty camera option is similar to apps like AirBrush with filter and makeup modes. The photo editor app also allows to create gifs and short animated videos with your selfie and stickers combined. This is one option that was missing with above apps. These can be with many scenes, roles, glasses, cats animals etc. Another great feature that I have found with this app is called Paint lab. It is similar to Prisma effects. The main con with this editing app is the number of ads shown is more. All of the above apps listed are somewhat heavy in footprint. If the user of budget phone comes here, he should not go back thinking that he cant install any of these apps since they are large in size. This app comes for their rescue, has a very small footprint – less than 2 MB. 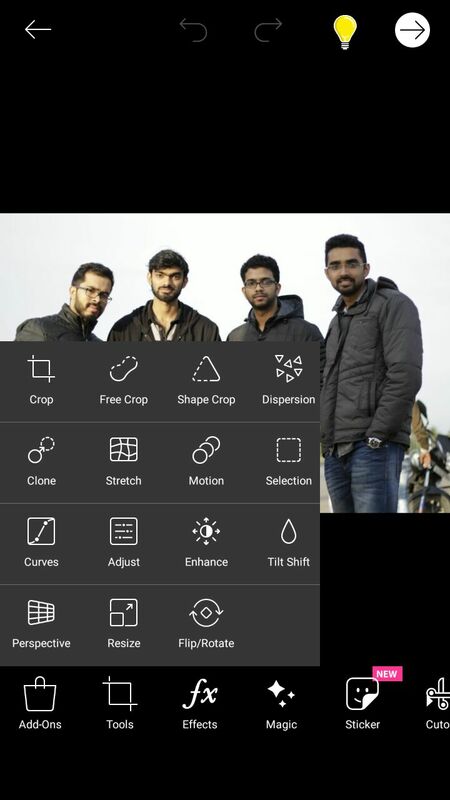 That is the only reason why this app has managed to get into the list of best photo editing apps for android. PicSay image editor was in town for a long time and served its purpose very effectively. You should not expect anything miraculous out of your image using this basic editor app. All it can do for you is to crop, resize and straighten the picture, apply some basic effects and add some stickers etc. The UI is very clean and intuitive, no one will complaint. The app imports picture without any issues. Which photo editor scores the most? From the above list of photo editing apps for android, I will personally use SnapSeed or Pixlr for single image editing. If I have to do create images for troll memes and posters, I might use PicsArt. The major disadvantage with many apps here is the over presence of ads. Sometimes it kills the user experience.